At the official website for Titanic: The Artifact Exhibition I found all the information needed to know what is offered at each exhibition, where they are located as well as opening and closing dates. The site also contains information for Students and Educators including Teacher’s Guides for Elementary, Middle and High School. These guides include lesson plans and activities aligned with Academic Content Standards. The site also provides online resources, frequently asked questions, and tips on preparing for your visit to an exhibition. 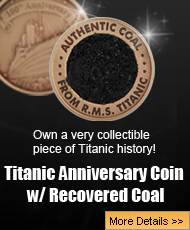 Brief Background On RMS Titanic, Inc.
As many of you know, the RMS Titanic, Inc (RMST) is the only company permitted by law (in 1994) to recover objects from the wreck of the Titanic. It has funded eight research and recovery expeditions – seven between 1987 and 2004 and the eighth in 2010. They recovered over 5500 artifacts – some as large as a 15 ton portion of the Titanic’s hull. These expeditions were extremely important… not only to help preserve the physical memory of the ship and its artifacts but also to remember the people who were lost. For the past century deterioration and corrosion have been destroying the ship and its artifacts. RMST, Inc. and its parent company, Premier Exhibitions, are committed to rescuing and preserving the legacy of the Titanic for current and future generations. A team of conservators, curators, registrars, archeologists, historians and other experts provide continual care and maintenance – using museum standards to preserve these artifacts so they can be shared with the public. Once each artifact has been put through the preservation process, it is then fully documented, catalogued and researched as to manufacture, history and use by passengers and/or crew. Artifacts selected for exhibits must be able to withstand travel and display. They are housed in cases with microclimates, special lighting and supports. Some can be displayed for long periods of time while others – fragile documents and textiles – are rotated regularly between exhibition and storage to preserve their condition. Each artifact has a preservation treatment plan. Each of the 8 exhibitions open at this time have some things in common. They take the visitor on a journey through the life of the Titanic; tell countless stories of heroism in the face of tragedy as well as highlighting the innovative recovery and conservation efforts. At the same time, each exhibition is created and tells it’s own story through whatever artifacts are shown at that venue. I’ve listed the venues alphabetically with a summary of its most interesting and important artifacts and programs. Atlanta will be one of three exhibition cities to display Jewels of Titanic. Along with 212 other artifacts will include 15 pieces of precious jewelry… diamonds, sapphires, pearls and gold jewelry owned by some of the wealthiest passengers. You will be able to see historically accurate room recreations, listen to stories of Titanic’s passengers and crew and learn of how Georgia is connected to it all. The Fort Worth Museum of Science and History will host The Artifact Exhibition. The Titanic story is told through focusing on the human stories told through 250 artifacts and extensive room recreations. Stories that tell of a perfume maker traveling to New York City to sell his wares; china from the White Star Line; and a 26-gem bracelet engraved with the name Amy. Each visitor will receive a replica of a boarding pass with the name and brief biography of an actual passenger which they will take to the “Memorial Gallery” to discover if their passenger survived. The Luxor exhibit will present about 300 items including a manmade iceberg , a recreated section of the ship’s promenade deck and the aforementioned 17 ton section of the ship’s shattered hull including some intact porthole glass! The Jewels of Titanic will also be displayed at some time during the exhibition. This is one of the largest exhibits.. a 17 gallery, 20,000 square foot interactive museum. Guided tours are led by trained actors playing the parts of Titanic notables such as Captain Smith and Molly Brown. Over 400 artifacts are shown as well as full scale replicas of the Grand Staircase, First Class Parlor Suite, the Verandah Café, and Boilers. It also touts the “Little Big Piece”- a 3 ton section of the hull. Something special happens every Saturday.. the “Titanic Dinner Show”. The Jewels of Titanic will also be displayed at some time during the exhibition. This is the second time the Titanic has come to Philadelphia – the first time in 2004. This is an expanded version with much more humanistic story to tell. The exhibit includes over 300 artifacts such as a ladies wristwatch, a silvery metal mesh evening bag, a hand-mirror and brush, the vest and pants of a man’s Edwardian suit, a shaving brush and a derby-shaped hat. These belongings make this story very real and personal. Galleries are arranged in chronological order. Visitors see the construction yard, the maiden voyage, the sinking — with effects like feeling the temperature drop and being able to touch an iceberg. This exhibition will display more than 200 artifacts as well as recreations of the interior of the ship, including a replica of the Grand Staircase, Titanic’s bridge, a watertight door and a section of first-class hallway. Artifacts on display include clothing, jewelry, china, furniture and fixtures from steerage quarters. One item included in the Raleigh exhibit is the ship’s bell. The curator explained, “Titanic had three different bells. This is the one that hung in the lookout cage. So when the lookout rang the bell for iceberg dead ahead, this is the one he rang. 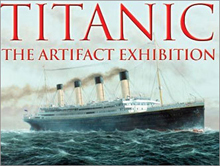 Titanic Exhibit, St. Petersburg, Florida: October 6, 2012 – March 3, 2013. This is the second time the Titanic has come to St. Petersburg – the first time in 2007. One of the displays replicates how porcelain dishes were found on the ocean floor. Amazingly, the wooden case they were packed in had rotted away, leaving them safe and unbroken. The tanning process used at that time for leather luggage protected what was inside so artifacts packed away in them also survived well. Many of these – currency, letters and clothes are on display. The Exhibition at the Science Center also creates the boarding pass experience, galleries that show replica’s of staterooms, and many original artifacts entwined in stories of its passengers. It also has Titanic-themed programs including Titanic Sky: the stars and constellations present during the final hours and lunch aboard the Titanic. This Exhibition will include over 150 artifacts and will have many of the replicas and events described above. Please check closer to the time of the grand opening for more details. Previous post: Is Clive Palmer Really Having a Replica of the Titanic Built?